Traditionally, the television sits in the corner of the lounge room but there are times when you’d rather it was somewhere more convenient. You could fill your house with portable tellies but that’s expensive and you can’t get too far from a power point. But there is a better way – thanks to Sharp. The amazing Sharp AQUOS Wireless TV is a world first, a revolution in television technology. 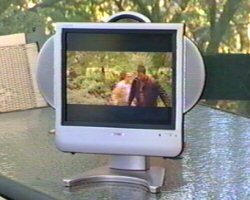 It’s a fully portable wireless LCD TV. You can now have the convenience of a crystal clear TV anywhere in or outside your home – up to 30 metres from the base station. The 15 inch screen is crisp and clear with Advanced Super View Technology for reduced glare and reflection. Sharp uses a 2 point 4 Ghertz digital wireless transmission system and high tech lithium-ion batteries that’ll give you 2 to 3 hours viewing – depending on how bright you need the screen to be. You can watch practically everything, practically everywhere – DVD, videos, even cable channels! But now, they’re all portable. There’s been a lot of talk about plasma TVs lately. But the Sharp LCDs are lighter, use less power, are easier on the eye and last longer. Playing Playstation or X-Box on LCD won’t create burn-ins like they do on a plasma screen. Sharp’s incredible innovations just keep coming with the new G series. They range from 26 inch to 37 inch. They’re lighter, slimmer and have a PC Card slot. You can insert data storing cards from your digital camera, video or computer and view the contents on the big screen. You can even record a TV show or movie direct to the card! It couldn’t be simpler. The Sharp AQUOS 37 Custom Series, with excellent colour, superb contrast in any light and a wonderfully wide 170 viewing angle. This fabulous Sharp television supports high definition TV and is perfect for the new digital cable service. The Custom Series is so stylish it will complement any décor. It’s easy to check out these marvellous Sharp TVs and all the other impressive Sharp technology.